BrdU (red), a marker of DNA replication, highlights neurogenesis in the subgranular zone of hippocampal dentate gyrus. Fragment of an illustration from Faiz et al., 2005. Doublecortin expression in the rat dentate gyrus, 21st postnatal day. Oomen et al., 2009. Neurogenesis is the process of birth of neurons wherein neurons are generated from neural stem cells. Contrary to popular belief, neurogenesis continuously occurs in specific regions in the adult brain. Developmental neurogenesis and adult neurogenesis differ markedly. This article is limited in scope to adult neurogenesis. The subgranular zone (SGZ), part of the dentate gyrus of the hippocampus. The striatum; however the adult-born neurons are a type of interneuron, not a type that projects to other brain areas. In other species of mammals, particularly rodents, adult-born neurons also appear in the olfactory bulb. In humans, however, few if any olfactory bulb neurons are generated after birth. Much more attention has been paid to neurogenesis in the dentate gyrus than in the other areas. Many of the newborn dentate gyrus neurons die shortly after they are born, but a number of them become functionally integrated into the surrounding brain tissue. Neural stem cells (NSCs) are the self-renewing, multipotent cells that generate the main phenotypes of the nervous system. The creation of new functional brain cells can be measured in several ways, summarized in the following sections. Labelled DNA can trace dividing cell's lineage, and determine the location of its daughter cells. A nucleic acid analog is inserted into the genome of a neuron-generating cell (such as a glial cell or neural stem cell). Thymine analogs (3H) thymidine and BrdU are commonly used DNA labels, and are used for radiolabelling and immunohistochemistry respectively. DNA labeling can be used in conjunction with neuronal lineage markers to determine the fate of new functional brain cells. First, incorporated labeled nucleotides are used to detect the populations of newly divided daughter cells. Specific cell types are then determined with unique differences in their expression of proteins, which can be used as antigens in an immunoassay. For example, NeuN/Fox3 and GFAP are antigens commonly used to detect neurons, glia, and ependymal cells. Ki67 is the most commonly used antigen to detect cell proliferation. Some antigens can be used to measure specific stem cell stages. For example, stem cells requires the sox2 gene to maintain pluripotency and is used to detect enduring concentrations of stem cells in CNS tissue. The protein nestin is an intermediate filament, which is essential for the radial growth of axons, and is therefore used to detect the formation of new synapses. Some genetic tracing studies utilize cre-lox recombination to bind a promoter to a reporter gene, such as lacZ or GFP gene. This method can be used for long term quantification of cell division and labeling, whereas the previously mentioned procedures are only useful for short-term quantification. The use of a retrovirus to insert specific markers within cells has recently become more common. A marker, such as GFP, is inserted into a cell containing a known marker via a viral vector. The insertion of genetic material via a retrovirus tends to be sporadic and infrequent relative to the total number of cells in a given region of tissue, making quantification of cell division inaccurate. However, retroviruses provide highly accurate data with respect to when a cell was born as well as full cellular morphologies. Furthermore, due to the presence of reverse transcriptase, retroviruses can also be used to modify the genomes of cells in vivo for further study. The functional relevance of adult neurogenesis is uncertain, but there is some evidence that hippocampal adult neurogenesis is important for learning and memory. Multiple mechanisms for the relationship between increased neurogenesis and improved cognition have been suggested, including computational theories to demonstrate that new neurons increase memory capacity, reduce interference between memories, or add information about time to memories. Experiments aimed at ablating neurogenesis have proven inconclusive, but several studies have proposed neurogenic-dependence in some types of learning, and others seeing no effect. Studies have demonstrated that the act of learning itself is associated with increased neuronal survival. However, the overall findings that adult neurogenesis is important for any kind of learning are equivocal. Some studies suggest that decreased hippocampal neurogenesis can lead to development of Alzheimer's disease. Yet, others hypothesize that AD patients have increased neurogenesis in the CA1 region of Ammon's horn (the principal region of AD hippocampal pathology) in order to compensate for neuronal loss. While the exact nature of the relationship between neurogenesis and Alzheimer's Disease is unknown, Insulin-like growth factor 1-stimulated neurogenesis produces major changes in hippocampal plasticity and seems to be involved in Alzheimer's pathology. Allopregnanolone, a neurosteroid, aids the continued neurogenesis in the brain. Levels of allopregnanolone in the brain decline in old age and Alzheimer's disease. Allopregnanolone has been shown through reversing impairment of neurogenesis to reverse the cognitive deficits in a mouse model of Alzheimer's disease. Eph receptors and ephrin signaling have been shown to regulate adult neurogenesis in the hippocampus and have been studied as potential targets to treat some symptoms of AD. Molecules associated with the pathology of AD, including ApoE, PS1 and APP, have also been found to impact adult neurogenesis in the hippocampus. Foreword: With subjective incentivized diagnosis often comes treatment with psychotropic drugs which inherently lead to neuronal damage so any correlation between the "disease" and neuronal depreciation must be viewed cautiously. Studies suggest that people with schizophrenia have a reduced hippocampus volume, which is believed to be caused by a reduction of adult neurogenesis. Correspondingly, this phenomenon might be the underlying cause of many of the symptoms of the disease. Furthermore, several research papers referred to four genes, dystrobrevin binding protein 1 (DTNBP1), neuregulin 1 (NRG1), disrupted in schizophrenia 1 (DISC1), and neuregulin 1 receptor (ERBB4), as being possibly responsible for this deficit in the normal regeneration of neurons. It is important to state that, unlike Alzheimer's disease, schizophrenia is not characterized by degenerative neural functions, but rather by an abnormal rate of neurogenesis and an abnormal neuroplasticity. On the other hand, antipsychotics have shown a significant promise as a reliable way to increase the rates of neurogenesis. Similarities between depression and schizophrenia suggest a possible biological link between the two diseases. However, further research must be done in order to clearly demonstrate this relationship. Many now believe stress to be the most significant factor for the onset of depression, aside from genetics. As discussed above, hippocampal cells are sensitive to stress which can lead to decreased neurogenesis. This area is being considered more frequently when examining the causes and treatments of depression. Studies have shown that removing the adrenal gland in rats caused increased neurogenesis in the dentate gyrus. The adrenal gland is responsible for producing cortisol in response to a stressor, a substance that when produced in chronic amounts causes the down regulation of serotonin receptors and suppresses the birth of neurons. It was shown in the same study that administration of corticosterone to normal animals suppressed neurogenesis, the opposite effect. The most typical class of antidepressants administered for this disease are selective serotonin reuptake inhibitors (SSRIs)  and their efficacy may be explained by neurogenesis. In a normal brain, an increase in serotonin causes suppression of the corticotropin-releasing hormone (CRH) through connection to the hippocampus. It directly acts on the paraventricular nucleus to decrease CRH release and down regulate norepinephrine functioning in the locus coeruleus. Because CRH is being repressed, the decrease in neurogenesis that is associated with elevated levels of it is also being reversed. This allows for the production of more brain cells, in particular at the 5-HT1a receptor in the dentate gyrus of the hippocampus which has been shown to improve symptoms of depression. It normally takes neurons approximately three to six weeks to mature, which is approximately the same amount of time it takes for SSRIs to take effect. This correlation strengthens the hypothesis that SSRIs act through neurogenesis to decrease the symptoms of depression. Some neuroscientists have expressed skepticism that neurogenesis is functionally significant, given that a tiny number of nascent neurons are actually integrated into existing neural circuitry. However, a recent study used the irradiation of nascent hippocampal neurons in rodents to demonstrate that neurogenesis is required for antidepressant efficacy. Adult-born neurons appear to have a role in the regulation of stress. Studies have linked neurogenesis to the beneficial actions of specific antidepressants, suggesting a connection between decreased hippocampal neurogenesis and depression. In a pioneer study, scientists demonstrated that the behavioral benefits of antidepressant administration in mice is reversed when neurogenesis is prevented with x-irradiation techniques. In fact, newborn neurons are more excitable than older neurons due to a differential expression of GABA receptors. A plausible model, therefore, is that these neurons augment the role of the hippocampus in the negative feedback mechanism of the HPA-axis (physiological stress) and perhaps in inhibiting the amygdala (the region of brain responsible for fearful responses to stimuli). Indeed, suppression of adult neurogenesis can lead to an increased HPA-axis stress response in mildly stressful situations. This is consistent with numerous findings linking stress-relieving activities (learning, exposure to a new yet benign environment, and exercise) to increased levels of neurogenesis, as well as the observation that animals exposed to physiological stress (cortisol) or psychological stress (e.g. isolation) show markedly decreased levels of newborn neurons. Interestingly, under chronic stress conditions, the elevation of newborn neurons by antidepressants improves the hippocampal-dependent control on the stress response; without newborn neurons, antidepressants are unable to restore the regulation of the stress response and recovery becomes impossible. Some studies have hypothesized that learning and memory are linked to depression, and that neurogenesis may promote neuroplasticity. One study proposes that mood may be regulated, at a base level, by plasticity, and thus not chemistry. Accordingly, the effects of antidepressant treatment would only be secondary to change in plasticity. However another study has demonstrated an interaction between antidepressants and plasticity; the antidepressant fluoxetine has been shown to restore plasticity in the adult rat brain. The results of this study imply that instead of being secondary to changes in plasticity, antidepressant therapy could promote it. One study has linked lack of sleep to a reduction in rodent hippocampal neurogenesis. The proposed mechanism for the observed decrease was increased levels of glucocorticoids. It was shown that two weeks of sleep deprivation acted as a neurogenesis-inhibitor, which was reversed after return of normal sleep and even shifted to a temporary increase in normal cell proliferation. More precisely, when levels of corticosterone are elevated, sleep deprivation inhibits this process. Nonetheless, normal levels of neurogenesis after chronic sleep deprivation return after 2 weeks, with a temporary increase of neurogenesis. While this is recognized, overlooked is the blood glucose demand exhibited during temporary diabetic hypoglycemic states. The American Diabetes Association amongst many documents the pseudosenilia and agitation found during temporary hypoglycemic states. Much more clinical documentation is needed to competently demonstrate the link between decreased hematologic glucose and neuronal activity and mood. Parkinson's disease is a neurodegenerative disorder characterized by a progressive loss of dopaminergic neurons in the substantia nigra. Transplantation of fetal dopaminergic precursor cells has paved the way for the possibility of a cell replacement therapy that could ameliorate clinical symptoms in affected patients. In recent years, scientists have provided evidence for the existence of neural stem cells with the potential to produce new neurons, particularly of a dopaminergic phenotype, in the adult mammalian brain. Experimental depletion of dopamine in rodents decreases precursor cell proliferation in both the subependymal zone and the subgranular zone. Proliferation is restored completely by a selective agonist of D2-like (D2L) receptors. Neural stem cells have been identified in the neurogenic brain regions, where neurogenesis is constitutively ongoing, but also in the non-neurogenic zones, such as the midbrain and the striatum, where neurogenesis is not thought to occur under normal physiological conditions. Newer research has shown that there in fact is neurogenesis in the striatum. A detailed understanding of the factors governing adult neural stem cells in vivo may ultimately lead to elegant cell therapies for neurodegenerative disorders such as Parkinson's disease by mobilizing autologous endogenous neural stem cells to replace degenerated neurons. Neurogenesis is substantially reduced in the hippocampus of aged animals, raising the possibility that it may be linked to age-related declines in hippocampal function. For example, the rate of neurogenesis in aged animals is predictive of memory. However, new born cells in aged animals are functionally integrated. Given that neurogenesis occurs throughout life, it might be expected that the hippocampus would steadily increase in size during adulthood, and that therefore the number of granule cells would be increased in aged animals. However, this is not the case, indicating that proliferation is balanced by cell death. Thus, it is not the addition of new neurons into the hippocampus that seems to be linked to hippocampal functions, but rather the rate of turnover of granule cells. Scientists have shown that physical activity in the form of voluntary exercise results in an increase in the number of newborn neurons in the hippocampus of mice and rats. These and other studies have shown that learning in both species can be enhanced by physical exercise. Recent research has shown that brain-derived neurotrophic factor and insulin-like growth factor 1 are key mediators of exercise-induced neurogenesis. Exercise increase the production of BDNF, as well as the NR2B subunit of the NMDA receptor. Exercise increases the uptake of IGF-1 from the bloodstream into various brain regions, including the hippocampus. In addition, IGF-1 alters c-fos expression in the hippocampus. When IGF-1 is blocked, exercise no longer induces neurogenesis. Other research demonstrated that exercising mice that did not produce beta-endorphin, a mood-elevating hormone, had no change in neurogenesis. Yet, mice that did produce this hormone, along with exercise, exhibited an increase in newborn cells and their rate of survival. While the association between exercise-mediated neurogenesis and enhancement of learning remains unclear, this study could have strong implications in the fields of aging and/or Alzheimer's disease. Some studies have shown that the stimulation of the cannabinoids results in the growth of new nerve cells in the hippocampus from both embryonic and adult stem cells. In 2005 a clinical study of rats at the University of Saskatchewan showed regeneration of nerve cells in the hippocampus. Studies have shown that a synthetic drug resembling THC, the main psychoactive ingredient in marijuana, provides some protection against brain inflammation, which might result in better memory at an older age. This is due to receptors in the system that can also influence the production of new neurons. Nonetheless, a study directed at Rutgers University demonstrated how synchronization of action potentials in the hippocampus of rats was altered after THC administration. Lack of synchronization corresponded with impaired performance in a standard test of memory. Recent studies indicate that a natural cannabinoid of cannabis, cannabidiol (CBD), increases adult neurogenesis while having no effect on learning. THC however impaired learning and had no effect on neurogenesis. A greater CBD to THC ratio in hair analyses of cannabis users correlates with protection against gray matter reduction in the right hippocampus. CBD has also been observed to attenuate the deficits in prose recall and visuo-spatial associative memory of those currently under the influence of cannabis, implying neuroprotective effects against heavy THC exposure. Neurogenesis might play a role in its neuroprotective effects, but further research is required. Summary of the signalling pathways in the neural stem cell microenvironment. Many factors may affect the rate of hippocampal neurogenesis. Exercise and an enriched environment have been shown to promote the survival of neurons and the successful integration of newborn cells into the existing hippocampus. Another factor is central nervous system injury since neurogenesis occurs after cerebral ischemia, epileptic seizures, and bacterial meningitis. On the other hand, conditions such as chronic stress and aging can result in a decreased neuronal proliferation. Circulating factors within the blood may reduce neurogenesis. In healthy aging humans, the plasma and cerebrospinal fluid levels of certain chemokines are elevated. In a mouse model, plasma levels of these chemokines correlate with reduced neurogenesis, suggesting that neurogenesis may be modulated by certain global age-dependent systemic changes. These chemokines include CCL11, CCL2 and CCL12, which are highly localized on mouse and human chromosomes, implicating a genetic locus in aging. Epigenetic regulation also plays a large role in neurogenesis. DNA methylation is critical in the fate-determination of adult neural stem cells in the subventricular zone for post-natal neurogenesis through the regulation of neuronic genes such as Dlx2, Neurog2, and Sp8. Many microRNAs such as miR-124 and miR-9 have been shown to influence cortical size and layering during development. Early neuroanatomists, including Santiago Ramón y Cajal, considered the nervous system fixed and incapable of regeneration. The first evidence of adult mammalian neurogenesis in the cerebral cortex was presented by Joseph Altman in 1962, followed by a demonstration of adult neurogenesis in the dentate gyrus of the hippocampus in 1963. In 1969, Joseph Altman discovered and named the rostral migratory stream as the source of adult generated granule cell neurons in the olfactory bulb. Up until the 1980s, the scientific community ignored these findings despite use of the most direct method of demonstrating cell proliferation in the early studies, i.e. 3H-thymidine autoradiography. By that time, Shirley Bayer (and Michael Kaplan) again showed that adult neurogenesis exists in mammals (rats), and Nottebohm showed the same phenomenon in birds sparking renewed interest in the topic. Studies in the 1990s finally put research on adult neurogenesis into a mainstream pursuit. Also in the early 1990s hippocampal neurogenesis was demonstrated in non-human primates and humans. 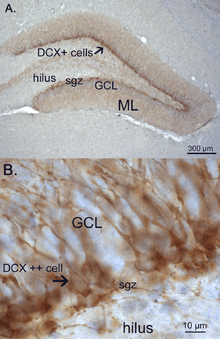 More recently, neurogenesis in the cerebellum of adult rabbits has also been characterized. Further, some authors (particularly Elizabeth Gould) have suggested that adult neurogenesis may also occur in regions within the brain not generally associated with neurogenesis including the neocortex. However, others have questioned the scientific evidence of these findings, arguing that the new cells may be of glial origin. Recent research has elucidated the regulatory effect of GABA on neural stem cells. GABA's well-known inhibitory effects across the brain also affect the local circuitry that triggers a stem cell to become dormant. They found that diazepam (Valium) has a similar effect. ↑ Faiz M; Acarin L; Castellano B; Gonzalez B (2005). "Proliferation dynamics of germinative zone cells in the intact and excitotoxically lesioned postnatal rat brain". BMC Neuroscience. 6: 26. doi:10.1186/1471-2202-6-26. PMC 1087489 . PMID 15826306. ↑ Oomen CA; Girardi CE; Cahyadi R; et al. (2009). Baune, Bernhard, ed. "Opposite effects of early maternal deprivation on neurogenesis in male versus female rats". PLoS ONE. 4 (1): e3675. Bibcode:2009PLoSO...4.3675O. doi:10.1371/journal.pone.0003675. PMC 2629844 . PMID 19180242. ↑ Ernst, A; Frisén, J (January 2015). "Adult neurogenesis in humans- common and unique traits in mammals.". PLoS biology. 13 (1): e1002045. doi:10.1371/journal.pbio.1002045. PMC 4306487 . PMID 25621867. 1 2 Dayer, A.G.; Ford, A.A.; Cleaver, K.M. ; Yassaee, M.; Cameron, H.A. (2003). "Short-term and long-term survival of new neurons in the rat dentate gyrus". The Journal of Comparative Neurology. 460 (4): 563–572. doi:10.1002/cne.10675. ↑ Ernst A, Alkass K, Bernard S, Salehpour M, Perl S, Tisdale J, Possnert G, Druid H, Frisén J (2014). "Neurogenesis in the striatum of the adult human brain". Cell. 156 (5): 1072–83. doi:10.1016/j.cell.2014.01.044. PMID 24561062. ↑ Bergmann, O.; Liebel, J.; Bernard, S.; Alkass, K.; Yeung, M.S.Y. ; Steier, P.; Kutschera, W.; Johnson, L.; Landen, M.; Druid, H.; Spalding, K.L. ; Frisen, J. (2012). "The age of olfactory bulb neurons in humans". Neuron. 74: 634–639. doi:10.1016/j.neuron.2012.03.0. ↑ Toni, N.; Teng, E.M.; Bushong, E.A. ; Aimone, J.B.; Zhao, C.; Consiglio, A.; van Praag, H.; Martone, M.E. ; Ellisman, M.H. ; Gage, F.H. (2007). "Synapse formation on neurons born in the adult hippocampus". Nature Neuroscience. 10 (6): 727–734. doi:10.1038/nn1908. ↑ Vivar, C.; Potter, M.C. ; Choi, J.; Lee, J.; Stringer, T.P. ; Callawy, E.M.; Gage, F.H. ; Suh, H.; van Praag, H. (2012). "Monosynaptic inputs to new neurons in the dentate gyrus.". Nature Communications. 3 (1038): 1107. doi:10.1038/ncomms2101. ↑ Toni, N.; Laplagne, D.A. ; Zhao, C.; Lombardi, G.; Ribak, C.E. ; Gage, F.H. ; Schinder, A.F. (2008). "Neurons born in the adult dentate gyrus form functional synapses with target cells". Nature Neuroscience. 11 (8): 901–907. doi:10.1038/nn.2156. PMC 2572641 . PMID 18622400. ↑ Aimone, J. B., Y. Li, S. W. Lee, G. D. Clemenson, W. Deng, and F. H. Gage. "Regulation and Function of Adult Neurogenesis: From Genes to Cognition." Physiological Reviews 94.4 (2014): 991-1026. 1 2 Ming, Guo-Li, and Hongjun Song. "Adult Neurogenesis in the Mammalian Brain: Significant Answers and Significant Questions." Neuron 70.4 (2011): 687-702. ↑ Altman J (1962). "Are new neurons formed in the brains of adult mammals?". Science. 135: 1127–1128. doi:10.1126/science.135.3509.1127. PMID 13860748. ↑ Kuhn HG, Cooper-Kuhn CM (2007). "Bromodeoxyuridine and the detection of neurogenesis". Curr Pharmaceutical Biotechnol. 8: 127–131. ↑ Imayoshi I, Sakamoto M, Ohtsuka T, Takao K, Miyakawa T, Yamaguchi M, Mori K, Ikeda T, Itohara S, Kageyama R (2008). "Roles of continuous neurogenesis in the structural and functional integrity of the adult forebrain". Nat Neurosci. 11: 1153–1161. doi:10.1038/nn.2185. ↑ Zhao C, Teng EM, Summers RG Jr, Ming GL, Gage FH (2006). "Distinct morphological stages of dentate granule neuron maturation in the adult mouse hippocampus". J Neurosci. 26: 3–11. doi:10.1523/jneurosci.3648-05.2006. ↑ Kempermann G, Wiskott L, Gage FH (April 2004). "Functional significance of adult neurogenesis". Current Opinion in Neurobiology. 14 (2): 186–91. doi:10.1016/j.conb.2004.03.001. PMID 15082323. 1 2 G. Neves, G; S.F. Cooke; T.V. Bliss (2008). "Synaptic plasticity, memory and the hippocampus: A neural network approach to causality". Nature Reviews Neuroscience. 9 (1): 65–75. doi:10.1038/nrn2303. PMID 18094707. ↑ Becker S (2005). "A computational principle for hippocampal learning and neurogenesis". Hippocampus. 15 (6): 722–38. doi:10.1002/hipo.20095. PMID 15986407. ↑ Wiskott L, Rasch MJ, Kempermann G (2006). "A functional hypothesis for adult hippocampal neurogenesis: avoidance of catastrophic interference in the dentate gyrus". Hippocampus. 16 (3): 329–43. doi:10.1002/hipo.20167. PMID 16435309. ↑ Aimone JB, Wiles J, Gage FH (June 2006). "Potential role for adult neurogenesis in the encoding of time in new memories". Nat Neurosci. 9 (6): 723–7. doi:10.1038/nn1707. PMID 16732202. ↑ Shors TJ, Townsend DA, Zhao M, Kozorovitskiy Y, Gould E (2002). "Neurogenesis may relate to some but not all types of hippocampal-dependent learning". Hippocampus. 12 (5): 578–84. doi:10.1002/hipo.10103. PMC 3289536 . PMID 12440573. ↑ Meshi D, Drew MR, Saxe M, et al. (June 2006). "Hippocampal neurogenesis is not required for behavioral effects of environmental enrichment". Nat Neurosci. 9 (6): 729–31. doi:10.1038/nn1696. PMID 16648847. ↑ Gould, E.; Beylin, A.; Tanapat, P.; Reeves, A.; Shors, T. J. (1999). "Learning enhances adult neurogenesis in the hippocampal formation". Nature Neuroscience. 2 (3): 260–265. doi:10.1038/6365. PMID 10195219. ↑ Donovan, M. H.; Yazdani, U; Norris, R. D.; Games, D; German, D. C.; Eisch, A. J. (2006). "Decreased adult hippocampal neurogenesis in the PDAPP mouse model of Alzheimer's disease". The Journal of Comparative Neurology. 495 (1): 70–83. doi:10.1002/cne.20840. PMID 16432899. ↑ Jin, K; Peel, A. L.; Mao, X. O.; Xie, L; Cottrell, B. A.; Henshall, D. C.; Greenberg, D. A. (2004). "Increased hippocampal neurogenesis in Alzheimer's disease". Proceedings of the National Academy of Sciences. 101 (1): 343–7. doi:10.1073/pnas.2634794100. PMC 314187 . PMID 14660786. ↑ Foster, P. P.; Rosenblatt, K. P.; Kuljiš, R. O. (2011). "Exercise-induced cognitive plasticity, implications for mild cognitive impairment and Alzheimer's disease". Frontiers in Neurology. 2: 28. doi:10.3389/fneur.2011.00028. PMC 3092070 . PMID 21602910. ↑ Marx CE, Trost WT, Shampine LJ, et al. (December 2006). "The neurosteroid allopregnanolone is reduced in prefrontal cortex in Alzheimer's disease". Biol. Psychiatry. 60 (12): 1287–94. doi:10.1016/j.biopsych.2006.06.017. PMID 16997284. ↑ Wang JM, Singh C, Liu L, Irwin RW, Chen S, Chung EJ, Thompson RF, Brinton RD (2010). "Allopregnanolone reverses neuron and cognitive deficits in a mouse model of Alzheimer's disease" (PDF). Proc. Natl. Acad. Sci. U.S.A. 107 (14): 6498–6503. Bibcode:2010PNAS..107.6498W. doi:10.1073/pnas.1001422107. PMC 2851948 . PMID 20231471. ↑ Cissé, M; Checler, F (2014). "Eph receptors: New players in Alzheimer's disease pathogenesis". Neurobiology of Disease. 73C: 137–149. doi:10.1016/j.nbd.2014.08.028. PMID 25193466. ↑ Mu, Y; Gage, F. H. (2011). "Adult hippocampal neurogenesis and its role in Alzheimer's disease". Molecular Neurodegeneration. 6: 85. doi:10.1186/1750-1326-6-85. PMC 3261815 . PMID 22192775. ↑ LeStrat, Y (May 2009). "The role of genes involved in neuroplasticity and neurogenesis in the observation of a gene-environment interaction (GxE) in schizophrenia". Current Molecular Medicine. 9 (4): 506–18. doi:10.2174/156652409788167104. PMID 19519407. ↑ Schreiber, Rudy; Newman-Tancredi, Adrian (April 2014). "Improving cognition in schizophrenia with antipsychotics that elicit neurogenesis through 5-HT1A receptor activation". Neurobiology of Learning and Memory. 110: 72–80. doi:10.1016/j.nlm.2013.12.015. Retrieved 2 December 2014. ↑ Reif, Andreas; Schmitt, Angelika; Fritzen, Sabrina; Lesch, Klaus-Peter (27 Apr 2007). "Neurogenesis and schizophrenia: dividing neurons in a divided mind?". European Archives of Psychiatry and Clinical Neuroscience. 257 (5): 290–299. doi:10.1007/s00406-007-0733-3. Retrieved 2 December 2014. 1 2 3 Jacobs, B. L.; H. van Praag; F. H. Gage (2000). "Depression and the Birth and Death of Brain Cells". American Scientist. 88. ↑ Kandel, E. R.; J. H. Schwartz & T. M. Jessell (2012-10-26). Principles of Neural Science (fifth ed.). ISBN 0071390111. ↑ National Institute of Mental Health (2010). "Mental Health Medications" (PDF). ↑ Davies-Sala, M. G.; Espósito, M. S.; Piatti, V. C.; Mongiat, L. A.; Trinchero M. F. & Schinder A. F. (25 May 2011). "The Timing for Neuronal Maturation in the Adult Hippocampus Is Modulated by Local Network Activity". The Journal of Neuroscience. 31 (21). ↑ Perera TD, Dwork AJ, Keegan KA, Thirumangalakudi L, Lipira CM, Joyce N, Lange C, Higley JD, Rosoklija G, Hen R, Sackeim HA, Coplan JD (2011). "Necessity of hippocampal neurogenesis for the therapeutic action of antidepressants in adult nonhuman primates". PLoS ONE. 6: e17600. doi:10.1371/journal.pone.0017600. PMC 3078107 . PMID 21525974. 1 2 Schloesser RJ, Manji HK, Martinowich K (April 2009). "Suppression of adult neurogenesis leads to an increased hypothalamo-pituitary-adrenal axis response.". NeuroReport. 20 (6): 553–7. doi:10.1097/WNR.0b013e3283293e59. PMC 2693911 . PMID 19322118. 1 2 Surget A, Tanti A, Leonardo ED, et al. (December 2011). "Antidepressants recruit new neurons to improve stress response regulation.". Molecular Psychiatry. 16 (12): 1177–88. doi:10.1038/mp.2011.48. PMC 3223314 . PMID 21537331. ↑ Malberg JE, Eisch AJ, Nestler EJ, Duman RS (December 2000). "Chronic antidepressant treatment increases neurogenesis in adult rat hippocampus". J Neurosci. 20 (24): 9104–10. PMID 11124987. ↑ Manev H, Uz T, Smalheiser NR, Manev R (January 2001). "Antidepressants alter cell proliferation in the adult brain in vivo and in neural cultures in vitro". Eur J Pharmacol. 411 (1-2): 67–70. doi:10.1016/S0014-2999(00)00904-3. PMID 11137860. ↑ Santarelli L, Saxe M, Gross C, et al. (August 2003). "Requirement of hippocampal neurogenesis for the behavioral effects of antidepressants". Science. 301 (5634): 805–9. Bibcode:2003Sci...301..805S. doi:10.1126/science.1083328. PMID 12907793. ↑ Castrén E (March 2005). "Is mood chemistry?". Nature Reviews Neuroscience. 6 (3): 241–6. doi:10.1038/nrn1629. PMID 15738959. ↑ Vetencourt, J. F. M.; Sale, A.; Viegi, A.; Baroncelli, L.; De Pasquale, R.; f. o'Leary, O.; Castren, E.; Maffei, L. (2008). "The Antidepressant Fluoxetine Restores Plasticity in the Adult Visual Cortex". Science. 320 (5874): 385–8. doi:10.1126/science.1150516. PMID 18420937. ↑ Mirescu C, Peters JD, Noiman L, Gould E (December 2006). "Sleep deprivation inhibits adult neurogenesis in the hippocampus by elevating glucocorticoids". Proc. Natl. Acad. Sci. U.S.A. 103 (50): 19170–5. Bibcode:2006PNAS..10319170M. doi:10.1073/pnas.0608644103. PMC 1748194 . PMID 17135354. ↑ Mirescu C.; Peters J. D.; Noiman L.; Gould E. (2006). "Sleep deprivation inhibits adult neurogenesis in the hippocampus by elevating glucocorticoids.". Proceedings of the National Academy of Sciences. 103: 19170–19175. doi:10.1073/pnas.0608644103. PMC 1748194 . PMID 17135354. 1 2 3 Arias-Carrión O, Freundlieb N, Oertel WH, Höglinger GU (October 2007). "Adult neurogenesis and Parkinson's disease". CNS Neurol Disord Drug Targets. 6 (5): 326–35. doi:10.2174/187152707783220875. PMID 18045161. ↑ Fallon J, Reid S, Kinyamu R, et al. (December 2000). "In vivo induction of massive proliferation, directed migration, and differentiation of neural cells in the adult mammalian brain". Proc. Natl. Acad. Sci. U.S.A. 97 (26): 14686–91. Bibcode:2000PNAS...9714686F. doi:10.1073/pnas.97.26.14686. PMC 18979 . PMID 11121069. ↑ Arias-Carrión O, Verdugo-Díaz L, Feria-Velasco A, et al. (October 2004). "Neurogenesis in the subventricular zone following transcranial magnetic field stimulation and nigrostriatal lesions". J Neurosci Res. 78 (1): 16–28. doi:10.1002/jnr.20235. PMID 15372495. ↑ Arias-Carrión O, Hernández-López S, Ibañez-Sandoval O, Bargas J, Hernández-Cruz A, Drucker-Colín R (November 2006). "Neuronal precursors within the adult rat subventricular zone differentiate into dopaminergic neurons after substantia nigra lesion and chromaffin cell transplant". J Neurosci Res. 84 (7): 1425–37. doi:10.1002/jnr.21068. PMID 17006899. 1 2 Höglinger GU, Rizk P, Muriel MP, et al. (July 2004). "Dopamine depletion impairs precursor cell proliferation in Parkinson disease". Nat Neurosci. 7 (7): 726–35. doi:10.1038/nn1265. PMID 15195095. ↑ Drapeau, E.; Mayo, W.; Aurousseau, C.; Moal, M.L. ; Piazza, P. & Abrous, D.N. (2003). "Spatial memory performances of aged rats in the water maze predict levels of hippocampal neurogenesis". PNAS. 100 (24): 14385–14390. doi:10.1073/pnas.2334169100. ↑ Marrone, D.F. ; Ramirez-Amaya, V. & Barnes, C.A. (2012). "Neurons generated in senescence maintain capacity for functional integration". Hippocampus. 22 (5): 1134–1142. doi:10.1002/hipo.20959. ↑ von Bohlen und Halbach O (2010). "Involvement of BDNF in age-dependent alterations in the hippocampus". Front Aging Neurosci. 2. doi:10.3389/fnagi.2010.00036. PMC 2952461 . PMID 20941325. ↑ an Praag H, Christie BR, Sejnowski TJ, Gage FH. Running enhances neurogenesis, learning, and long-term potentiation in mice. Proc Natl Acad Sci U S A. 1999 Nov 9;96(23):13427-31. PubMed PMID 10557337; PubMed Central PMCID: PMC23964. ↑ Farmer J, Zhao X, van Praag H, Wodtke K, Gage FH, Christie BR. Effects of voluntary exercise on synaptic plasticity and gene expression in the dentate gyrus of adult male Sprague-Dawley rats in vivo. Neuroscience. 2004;124(1):71-9. PubMed PMID 14960340. ↑ van Praag H, Christie BR, Sejnowski TJ, Gage FH. Running enhances neurogenesis, learning, and long-term potentiation in mice. Proc Natl Acad Sci U S A. 1999 Nov 9;96(23):13427-31. PubMed PMID 10557337; PubMed Central PMCID:PMC23964. 1 2 Farmer J, Zhao X, van Praag H, Wodtke K, Gage FH, Christie BR. Effects of voluntary exercise on synaptic plasticity and gene expression in the dentate gyrus of adult male Sprague-Dawley rats in vivo. Neuroscience. 2004;124(1):71-9. PubMed PMID 14960340. 1 2 Carro, E; Trejo, J. L.; Busiguina, S; Torres-Aleman, I (2001). "Circulating insulin-like growth factor I mediates the protective effects of physical exercise against brain insults of different etiology and anatomy". The Journal of neuroscience : the official journal of the Society for Neuroscience. 21 (15): 5678–84. PMID 11466439. ↑ "Adult neurogenesis". Brain Briefings. Society for Neuroscience. June 2007. Retrieved 2011-11-26. ↑ Wen Jiang; Yun Zhang; Lan Xiao; Jamie Van Cleemput; Shao-Ping Ji; Guang Bai; Xia Zhang (2005-11-01). "Cannabinoids promote embryonic and adult hippocampus neurogenesis and produce anxiolytic- and antidepressant-like effects". Journal of Clinical Investigation. 115 (11): 3104–16. doi:10.1172/JCI25509. PMC 1253627 . PMID 16224541. Retrieved 2011-03-02. ↑ Wolf, Susanne A.; Bick-Sander, Anika; Fabel, Klaus; Leal-Galicia, Perla; Tauber, Svantje; Ramirez-Rodriguez, Gerardo; Müller, Anke; Melnik, Andre; Waltinger, Tim P.; Ullrich, Oliver; Kempermann, Gerd (2010). "Cannabinoid receptor CB1 mediates baseline and activity-induced survival of new neurons in adult hippocampal neurogenesis". 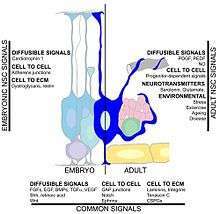 Cell Communication and Signaling. 8 (1): 12. doi:10.1186/1478-811X-8-12. PMID 20565726. ↑ Demirakca, T.; Sartorius, A.; Ende, G.; Meyer, N.; Welzel, H.; Skopp, G.; Mann, K.; Hermann, D. (2010). "Diminished gray matter in the hippocampus of cannabis users: Possible protective effects of cannabidiol". Drug and Alcohol Dependence. 114 (2–3): 242–245. doi:10.1016/j.drugalcdep.2010.09.020. PMID 21050680. ↑ Wright, M. J.; Vandewater, S. A.; Taffe, M. A. (2013). "Cannabidiol attenuates deficits of visuospatial associative memory induced by Δ9tetrahydrocannabinol". British Journal of Pharmacology. 170 (7): 1365–1373. doi:10.1111/bph.12199. PMC 3838683 . PMID 23550724. ↑ Morgan, C. J. A.; Schafer, G.; Freeman, T. P.; Curran, H. V. (2010). "Impact of cannabidiol on the acute memory and psychotomimetic effects of smoked cannabis: Naturalistic study". The British Journal of Psychiatry. 197 (4): 285–290. doi:10.1192/bjp.bp.110.077503. PMID 20884951. ↑ Lazarov O, Robinson J, Tang YP, Hairston IS, Korade-Mirnics Z, Lee VM, Hersh LB, Sapolsky RM, Mirnics K, Sisodia SS (March 2005). "Environmental enrichment reduces Abeta levels and amyloid deposition in transgenic mice". Cell. 120 (5): 701–13. doi:10.1016/j.cell.2005.01.015. PMID 15766532. ↑ Van Praag, H.; Shubert, T.; Zhao, C.; Gage, F. (2005). "Exercise enhances learning and hippocampal neurogenesis in aged mice". Journal of Neuroscience. 25 (38): 8680–8685. doi:10.1523/JNEUROSCI.1731-05.2005. PMC 1360197 . PMID 16177036. ↑ Van Praag, H.; Kempermann, G.; Gage, F. (1999). "Running increases cell proliferation and neurogenesis in the adult mouse dentate gyrus". Nature Neuroscience. 2 (3): 266–270. doi:10.1038/6368. PMID 10195220. ↑ Bjørnebekk A, Mathé AA, Brené S (September 2005). "The antidepressant effect of running is associated with increased hippocampal cell proliferation". Int J Neuropsychopharmacol. 8 (3): 357–68. doi:10.1017/S1461145705005122. PMID 15769301. ↑ Jin K, Wang X, Xie L, et al. (August 2006). "Evidence for stroke-induced neurogenesis in the human brain". Proc. Natl. Acad. Sci. U.S.A. 103 (35): 13198–202. Bibcode:2006PNAS..10313198J. doi:10.1073/pnas.0603512103. PMC 1559776 . PMID 16924107. ↑ Parent JM; Elliott, RC; Pleasure, SJ; Barbaro, NM; Lowenstein, DH (2006). "Aberrant seizure-induced neurogenesis in experimental temporal lobe epilepsy". Annals of Neurology. 59 (1): 81–91. doi:10.1002/ana.20699. PMID 16261566. ↑ Gerber J, Tauber SC, Armbrecht I, Schmidt H, Brück W, Nau R (2009). "Increased neuronal proliferation in human bacterial meningitis". Neurology. 73 (13): 1026–32. doi:10.1212/WNL.0b013e3181b9c892. PMID 19786694. ↑ Lee AL, Ogle WO, Sapolsky RM (April 2002). "Stress and depression: possible links to neuron death in the hippocampus". Bipolar Disord. 4 (2): 117–28. doi:10.1034/j.1399-5618.2002.01144.x. PMID 12071509. ↑ Sheline YI, Gado MH, Kraemer HC (August 2003). "Untreated depression and hippocampal volume loss". Am J Psychiatry. 160 (8): 1516–8. doi:10.1176/appi.ajp.160.8.1516. PMID 12900317. ↑ Jiang, W.; et al. (2005). "Cannabinoids promote embryonic and adult hippocampus neurogenesis and produce anxiolytic- and antidepressant-like effects". The Journal of Clinical Investigation. 115 (11): 3104–3116. doi:10.1172/JCI25509. PMC 1253627 . PMID 16224541. ↑ Hu, X.L. ; Wang,Y. ; Shen, Q. (2012). "Epigenetic control on cell fate choice in neural stem cells". Protein & Cell. 3 (4): 278–290. doi:10.1007/s13238-012-2916-6. PMID 22549586. ↑ Altman, J. (1962). "Are new neurons formed in the brains of adult mammals?". Science. 135 (3509): 1127–1128. Bibcode:1962Sci...135.1127A. doi:10.1126/science.135.3509.1127. PMID 13860748. ↑ Altman, J. (1963). "Autoradiographic investigation of cell proliferation in the brains of rats and cats". The Anatomical Record. 145 (4): 573–591. doi:10.1002/ar.1091450409. PMID 14012334. ↑ Altman, J. (1969). "Autoradiographic and histological studies of postnatal neurogenesis. IV. Cell proliferation and migration in the anterior forebrain, with special reference to persisting neurogenesis in the olfactory bulb". The Journal of Comparative Neurology. 137 (4): 433–457. doi:10.1002/cne.901370404. PMID 5361244. ↑ Bayer, S. A.; Yackel, J. W.; Puri, P. S. (1982). "Neurons in the rat dentate gyrus granular layer substantially increase during juvenile and adult life". Science. 216 (4548): 890–892. Bibcode:1982Sci...216..890B. doi:10.1126/science.7079742. PMID 7079742. ↑ Bayer, S. A. (1982). "Changes in the total number of dentate granule cells in juvenile and adult rats: a correlated volumetric and 3H-thymidine autoradiographic study". Experimental brain research. Experimentelle Hirnforschung. Experimentation cerebrale. 46 (3): 315–323. doi:10.1007/bf00238626. PMID 7095040. ↑ Goldman SA, Nottebohm F (April 1983). "Neuronal production, migration, and differentiation in a vocal control nucleus of the adult female canary brain". Proc. Natl. Acad. Sci. U.S.A. 80 (8): 2390–4. Bibcode:1983PNAS...80.2390G. doi:10.1073/pnas.80.8.2390. PMC 393826 . PMID 6572982. ↑ Reynolds, B. A.; Weiss, S. (Mar 1992). "Generation of neurons and astrocytes from isolated cells of the adult mammalian central nervous system". Science. 255 (5052): 1707–1710. Bibcode:1992Sci...255.1707R. doi:10.1126/science.1553558. ISSN 0036-8075. PMID 1553558. ↑ Gage, F. H.; Ray, J.; Fisher, L. J. (1995). "Isolation, Characterization, and use of Stem Cells from the CNS". Annual Review of Neuroscience. 18: 159–92. doi:10.1146/annurev.ne.18.030195.001111. PMID 7605059. ↑ Eriksson PS, Perfilieva E, Björk-Eriksson T, et al. (November 1998). "Neurogenesis in the adult human hippocampus". Nat Med. 4 (11): 1313–7. doi:10.1038/3305. PMID 9809557. ↑ Gould, E.; Reeves; Fallah; Tanapat; Gross; Fuchs (1999). "Hippocampal neurogenesis in adult Old World primates" (Free full text). Proceedings of the National Academy of Sciences of the United States of America. 96 (9): 5263–5267. Bibcode:1999PNAS...96.5263G. doi:10.1073/pnas.96.9.5263. PMC 21852 . PMID 10220454. ↑ Ponti, G.; Peretto, B.; Bonfanti, L. (2008). Reh, Thomas A., ed. "Genesis of neuronal and glial progenitors in the cerebellar cortex of peripuberal and adult rabbits". PLoS ONE. 3 (6): e2366. Bibcode:2008PLoSO...3.2366P. doi:10.1371/journal.pone.0002366. PMC 2396292 . PMID 18523645. ↑ Gould, E.; Reeves, A. J.; Graziano, M. S.; Gross, C. G. (1999). "Neurogenesis in the neocortex of adult primates". Science. 286 (5439): 548–552. doi:10.1126/science.286.5439.548. PMID 10521353. ↑ Zhao, M.; Momma, S.; Delfani, K.; Carlen, M.; Cassidy, R. M.; Johansson, C. B.; Brismar, H.; Shupliakov, O.; Frisen, J.; Janson, A. (2003). "Evidence for neurogenesis in the adult mammalian substantia nigra". Proceedings of the National Academy of Sciences of the United States of America. 100 (13): 7925–7930. Bibcode:2003PNAS..100.7925Z. doi:10.1073/pnas.1131955100. PMC 164689 . PMID 12792021. ↑ Shankle; Rafii, M. S.; Landing, B. H.; Fallon, J. H. (1999). "Approximate doubling of numbers of neurons in postnatal human cerebral cortex and in 35 specific cytoarchitectural areas from birth to 72 months". Pediatric and developmental pathology : the official journal of the Society for Pediatric Pathology and the Paediatric Pathology Society. 2 (3): 244–259. doi:10.1007/s100249900120. PMID 10191348. ↑ Rakic P (February 2002). "Adult neurogenesis in mammals: an identity crisis". J. Neurosci. 22 (3): 614–8. PMID 11826088. Gould E, Reeves AJ, Fallah M, Tanapat P, Gross CG, Fuchs E (April 1999). "Hippocampal neurogenesis in adult Old World primates". Proc. Natl. Acad. Sci. U.S.A. 96 (9): 5263–7. Bibcode:1999PNAS...96.5263G. doi:10.1073/pnas.96.9.5263. PMC 21852 . PMID 10220454. Gould E, Reeves AJ, Graziano MS, Gross CG (October 1999). "Neurogenesis in the neocortex of adult primates". Science. 286 (5439): 548–52. doi:10.1126/science.286.5439.548. PMID 10521353. Gould E, Beylin A, Tanapat P, Reeves A, Shors TJ (March 1999). "Learning enhances adult neurogenesis in the hippocampal formation". Nat Neurosci. 2 (3): 260–5. doi:10.1038/6365. PMID 10195219. Moghadam KS, Chen A, Heathcote RD (August 2003). "Establishment of a ventral cell fate in the spinal cord". Dev. Dyn. 227 (4): 552–62. doi:10.1002/dvdy.10340. PMID 12889064. Rakic P (January 2002). "Neurogenesis in adult primate neocortex: an evaluation of the evidence". Nature Reviews Neuroscience. 3 (1): 65–71. doi:10.1038/nrn700. PMID 11823806. Santarelli L, Saxe M, Gross C, et al. (August 2003). "Requirement of hippocampal neurogenesis for the behavioral effects of antidepressants". Science. 301 (5634): 805–9. Bibcode:2003Sci...301..805S. doi:10.1126/science.1083328. PMID 12907793. Schloesser RJ, Manji HK, Martinowich K (April 2009). "Suppression of adult neurogenesis leads to an increased hypothalamo-pituitary-adrenal axis response.". NeuroReport. 20 (6): 553–7. doi:10.1097/WNR.0b013e3283293e59. PMC 2693911 . PMID 19322118. Shankle WR, Rafii MS, Landing BH, Fallon JH (1999). "Approximate doubling of the numbers of neurons in the postnatal human cortex and in 35 specific cytoarchitectonic areas from birth to 72 months". Pediatric and Developmental Pathology. 2: 244–259. doi:10.1007/s100249900120. PMID 10191348. Zhao M, Momma S, Delfani K, et al. (June 2003). "Evidence for neurogenesis in the adult mammalian substantia nigra". Proc. Natl. Acad. Sci. U.S.A. 100 (13): 7925–30. Bibcode:2003PNAS..100.7925Z. doi:10.1073/pnas.1131955100. PMC 164689 . PMID 12792021. Dedicated issue of Philosophical Transactions B on Stem Cells and Brain Repair. Some articles are freely available.